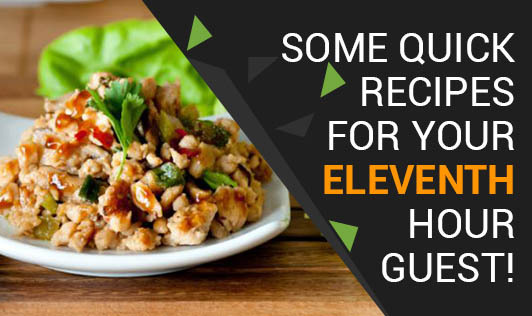 Some Quick Recipes for your Eleventh Hour Guest! I was at a coffee shop after a day's work to grab a quick bite, when I managed to get my hands on a magazine doing the rounds on the tables. Being a Nutritionist, my eyes naturally fell upon an article "My 11th Hour Recipe"! Well, I have had a reputation for entertaining guests at any time, so I figured this article would be most useful to me! And for all those people out there who share the same reputation, you could use these quick snacks for your guests! 1. Melt butter in a pan and add fresh chopped coriander, Grated lemon peel (lemon zest), salt, and pepper. 2. Place the hot popped corn in a serving bowl and pour the butter mixture over it. 4. Zesty popcorn is ready to serve. 1. Boil carrots until soft, drain. 2. Heat oil in a frying pan cook garlic and spices. 3. Blend or process carrot, spices, yogurt and coriander until smooth. 1. In a large mixing bowl, sift together flour and baking powder. 2. In a separate small bowl, mash the banana with a fork and add 50 ml of the milk, mixing together until there are no lumps. 3. Add the mashed banana, sugar and cinnamon remaining milk to the dry mix and stir. 4. Create a well in the center of the flour mixture and add skimmed milk, and vanilla essence. 6. Heat a non stick pan; use a ladle to pour batter into the pan. 7. Cook until bubbles form on top. 8. Turn pancakes cook they are cooked through, about 2 more minutes. 9. Serve immediately or keep warm on a plate covered with a foil. Repeat with remaining batter.